Can somebody tell me where I can find these with audio tapers? The datasheet says 0.04W. Unless it's a 'B', in which case it's 0.08W. Unfortunately it doesn't specify if they're referring to the taper, though that would be my assumption; and it's not a B taper. Either way, I'd stick with the lower of the two as a maximum rating. what is the smallest amount of movement this can measure in degrees? If you actually need one in an analog design, on the other hand, that design itself will dictate whether you'd want 10k, 4.7k, or something else entirely. I'll reply just to this comment, can copy the conclusion to the other one when we get there. The dimensions are in mm as best as I can tell. L-15 mm, W- 7 mm, K- 7.5 mm, M-1 mm, T - 6 mm is what I measured on one from stock. Hope that helps! As an aside, as one whose eyes are on the comments RSS frequently, I'd like to take this opportunity to say that you're doing an awesome job. Disclaimer: I'm not at SparkFun (sadface). From the datasheet, all the mounting diameters are 6. 6 'something'. Probably not 6 inches. From the description: "This pot has a 1/4" mounting diameter". 1/4" is.. well it's a bit over 6mm but 1.4" will fit just dandy. So let's assume the dimensions are mm. That brings us to the next questions (asked a year ago, too, but I'll poke at them here). Which of the pots at the top in the datasheet is this? Well there's only one row of pins, so the top-left one. Doesn't matter too much, though. Which dimensions am I supposed to be reading? The 6mm is all good and well, but what about the others? this pot next to a ruler From there we can measure other things. Let's go for a nice broad range, the 3cm mark. It comes down to about 364 pixels. Now let's do a sanity check, the shaft mount is supposed to be 6mm, so would expect to measure (364px/30mm*6mm)~=73px across. I measure 75px. 2px would be ~0.16mm, so I'll take my chances with that. We can determine the type next; the photos show us that the shaft mount has a slot all the way through, so it's a KQ type as indicated in the datasheet. You'd think you could calculate W from here, but unfortunately the bevels of the neck are excluded. Still, if you take L - T - M = 8mm, it's unlikely that those bevels are 1.5mm broad if the neck itself is only 1mm, which means it should be 7mm. Can't hurt to verify by measuring pixels, though - about 85px gives just a few thousandth of a mm over 7mm. Now, K can be 7.5mm or 6mm given our W of 7mm. 1.5mm isn't much, but it should be more than enough for measuring the pixels. Just about 91px gives, well, exactly 7.5mm. K (distance from center of shaft to structural supports) is 7.5mm. (Y=1) H is a bit more difficult - do these come with pins bent (photo), or straight (datasheet)? Doesn't matter, we can still give it a go - some straight segments should be a reasonable approximation, so pixels along the board where things are still nice and straight is 126px, while the bent lead up until the solder eyes is about 3.6+2+3.2+4.2+6.7+13=32.7px, totaling about 158.7px or ~13.1mm. Unfortunately that's not 12.5mm or 14.5mm. It's closer to 12.5mm, so let's call it that - but only because if you're soldering it to a PCB, that lead length doesn't matter after you cut them off, and if you're mounting it to a panel and solder wires to it, you can bend the pins - just as in the pixture - should you need that 2mm of extra space in the housing. It doesn't look like it but are these bread board friendly? Hello, Sadly no, this one is NOT breadboard friendly, That's what I'm here looking for today !!!! I'm confused by the datasheet and have a couple of questions. First, can I freely turn the knob as many rotations as I want in any given direction? Second, if I can indeed rotate it however I wish, will it always give the same reading when pointed at the same angle? ie, will it always read X when pointed at 90 degrees, regardless of how many rotations I've put it through? Should just be a single - incomplete - turn. 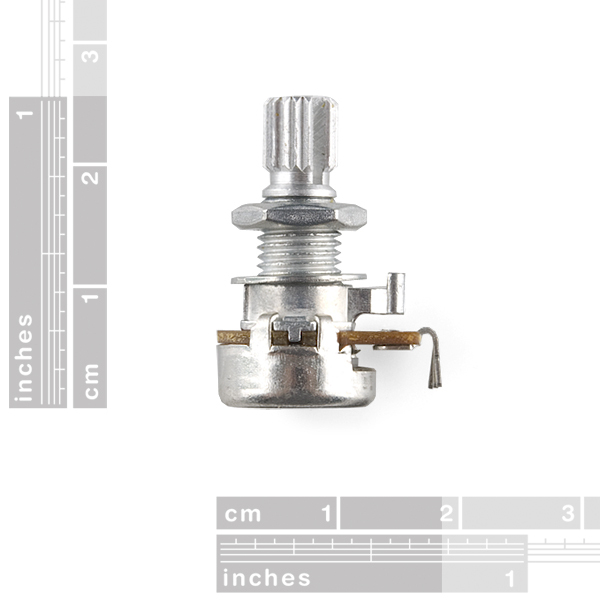 The datasheet specifies it as 300Â° +/- 10Â°. I also took a peek at the state of 'continuous' potentiometers and while they let you turn the shaft 'round and 'round, the vast majority of them have a resistor 'track' of about 340Â°. One of them specifies 352Â°. Note.. all of these cost more than $15 a piece because they're very specific instruments for very specific industrial processes. 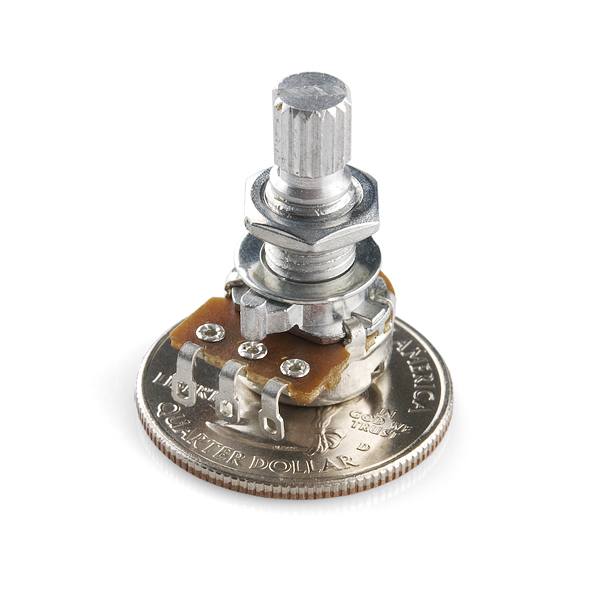 It would be much cheaper - though more finicky - for you to take a potentiometer such as this one, take it apart, and remove the physical stops (assuming it is not a threaded shaft that ends up going up/down). You'd still be stuck with the 300Â° resistor track but at least you can turn it around freely. 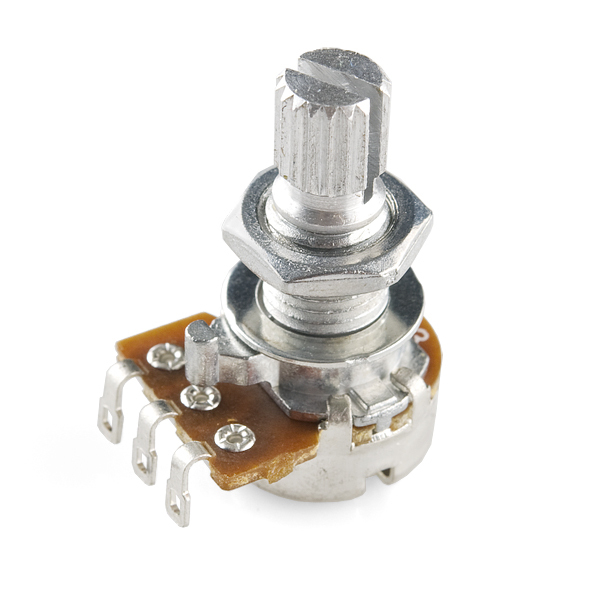 Alternatively, depending on what you'd need this for, I'd look at rotary encoders. Any update on reading the units? the datasheet is horribly non-descript. It is missing a lot of units for the measurements. I'm particularly interested in the position and diameter of the little peg that prevents it from spinning when panel mounted. Does anyone know, do these rotate continuously? 300 degrees of rotation, +/- 10 degrees. Whoops, RTFM to me~ Thanks! Is the shaft 1/4" for a 1/4" knob??? Sorry everyone. The descriptions are fixed. This one is linear. We also have a log. Product title says linear, description says logarithmic. I sure hope it's linear taper. Log taper is nice for audio, but for connecting to an ADC, linear makes a lot more sense. Perfect replacement pots or for use in new projects. Well built and small enough for cramped project boxes. Nice smooth operation and at a reasonable cost. Bought this to use with the LM317 and made an adjustable bench supply from an old ATX PSU. Movement is smooth, mounts easily, and the matching silver knob looks awesome on it. I haven't tested it electronically yet, but just FYI for anybody out there drilling holes to mount these things, they won't actually fit in a 1/4" hole!! I found this out after drilling 1/4" holes through 1/4" acrylic. The posts wouldn't fit, and so, busting out my trusty micrometer, I measured the threads and, much to my surprise, the major diameter on the threads is actually around .265", not .250"!! This may not matter if you're going through 1/32"-1/16" material, but this makes a difference on thicker materials. I'd recommend an 17/64" or 9/32" drill for mounting holes. Don't know if they test these before shipping, but out of the 16 I've tried so far from an order of 36, 1 is already a dud. Also don't buy in bulk -- they just throw them all in a single ziplock bag so a lot of the pins managed to get bent way out of shape during shipping. I mean it's easy enough to bend them back, but it's still uncool. and a really nice consistent friction. Screw threads are adequate, nothing super high quality. I am a great fan of Sparkfun, and love their stuff - for my lab, an advantage over places like Digikey is that you don't have to wade through 100,000 exotic options to find a reasonable item for a regular shop. I also like cheap and easy. This is not the place for getting milspec parts for your next deep space probe. But. I have had a LOT of problems with these. The can be flakey, and flakey is the hardest thing to debug. Jameco has some slightly bigger ones for like $1.50 or so. Maybe I just got a bad batch, but I would avoid.